On October 1, 1965, the teletype in the White House relayed the account of a supposed “coup” by a group of Indonesian army officers calling themselves the September 30th Movement. In Jakarta the movement, which had begun the night before under the alleged leadership of Lieutenant Colonel Untung with the kidnapping and killing of six generals of the Indonesian Army High Command, was already unraveling. The September 30th Movement was a relatively small-scale affair. It was poorly planned and so clumsily executed that it seemed almost preordained to fail. Major General Suharto, the commander of the army’s Strategic Reserve Command (KOSTRAD) rapidly routed the meager forces under Untung’s command, took control of the army, and blamed what he labeled a “coup attempt” entirely on the Indonesian Communist Party (PKI). Within two weeks, a much more momentous army-led and U.S.-backed movement to exterminate the PKI and its supporters was under way. Domestically, the PKI’s annihilation destroyed the political balance of power, dramatically undermining Sukarno and removing the only mass-based alternative to army rule. However, the emergence of the Indonesian army as the dominant political force and the military’s pressing need to address the country’s deep-rooted economic crisis also provided the United States and other Western powers with unusual leverage to shape the conditions under which the army would consolidate its power and legitimize its role in a military modernizing regime. The September 30th Movement and its bloody aftermath are central events in postwar Indonesian history, and competing interpretations of their roots, meaning, and legacy have become a cottage industry.3 Much of the debate has centered on the precise role of the PKI, the degree of Sukarno’s and/or Suharto’s foreknowledge of the “coup attempt,” and the local circumstances of the mass killings that followed. More important than the September 30th Movement itself was the use to which Suharto, the Indonesian army, and its international supporters put it in order to justify the annihilation of the PKI. Here the recent partial declassification of U.S. and British materials has made it possible to evaluate competing claims on the role of the United States and the United Kingdom with greater precision (and, since Suharto’s fall, less ideological baggage) and to come to a few tentative conclusions. First, although the available evidence does not directly implicate the United States in the September 30th Movement or in Sukarno’s ouster, quests for Washington’s hidden hand in this respect are beside the point. The United States and Britain unquestionably sought to entice the PKI into a coup attempt or some other rash action in the hopes of provoking a violent response by the army and organized covert operations and propaganda efforts to this end for the better part of a year, a fact unmitigated by Washington and London’s surprise at the actual timing of events. Second, U.S. encouragement of and support for the mass killings of alleged PKI supporters was greater than historians have heretofore acknowledged, as was that of the United Kingdom. But U.S. involvement in mass murder is only part of the story, and it is less illustrative of Washington’s long-range goals for Jakarta than the manner in which it engaged with the Indonesian army at the time of its greatest need to help midwife a parallel state apparatus, a strand of the story historians have accorded much less attention. Over the next few weeks, the army swiftly consolidated its gains and encouraged anti-Communist and religious groups to move against the PKI while building a public case that the Party represented a mortal alien threat to Indonesian society, a cancer to be cut out of the body politic. (When asked later by the Pakistani military attaché—a man respected for his excellent intelligence ties—how he could engage in the close killing of unarmed civilians, an Indonesian military interrogator said he considered it “a duty to exterminate what he called ‘less than animals. '”) The CIA reported that senior Indonesian generals met after the funeral for the slain generals and agreed to implement plans to “crush the PKI.”24 Three days later KAP-Gestapu held a second rally in Jakarta, this one drawing tens of thousands, after which protestors sacked and burned the PKI’s new headquarters. Signs and graffiti declaring “Hang the PKI” and “Hang Aidit” sprang up around the city.25 On October 10, Suharto established the Operations Command for the Restoration of Order and Security (KOPKAMTIB), which he used to launch a massive purge of the government apparatus and arrest thousands of PKI activists in Jakarta. 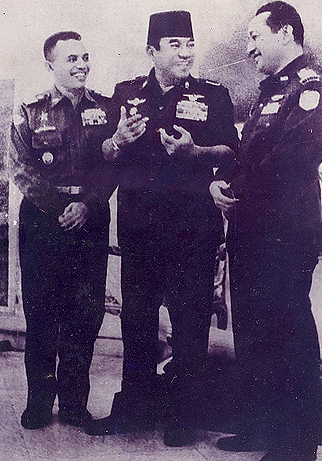 The next day, Sukarno was forced to name General Suharto commander of the armed forces. Most army leaders were anxious to avoid confronting Sukarno and hoped that he would bow to political realities and condemn the PKI and the September 30th Movement. The Great Leader’s persistent refusal to do so deeply frustrated the army, prompting some to call for his overthrow.32 “There are now two power centers in Indonesia, and not one,” the embassy cabled Foggy Bottom. It was important to let the army know which side the United States was on. (The Indonesian army, for its part, thought it was dealing with three power centers: the State Department, the Pentagon, and the CIA. )33 General Nasution provided an opportunity when his aide approached Marshall Green to request portable communications equipment for use by the Army High Command. It was just the sort of request the embassy could easily—and discreetly—meet, the State Department noted with approval, observing that the army was still keen to hide U.S. support and that “for [the] short run our assistance to them would probably have to be on covert or semi-covert basis related [to] specific, small, ad hoc needs.”34 The move toward covert U.S. assistance for the Indonesian military signaled Washington’s tacit withdrawal of recognition of Sukarno as the legitimate leader of Indonesia. The day before the 303 Committee approved the shipment of medicines to the army, the embassy cabled the State Department that RPKAD forces in Central Java under Edhie’s command were “providing Muslim youth with training and arms and ‘will keep them out in front’ against PKI.” While army leaders arrested higher-level PKI leaders for interrogation, “smaller fry” were “being systematically arrested and jailed or executed.”58 In North Sumatra and Aceh a few days later, “IP-KI [sic] Youth Organization [the Ikatan Pendukung Kemerdekaan Indonesia, or League of Upholders of Indonesian Independence, was an army-affiliated party], and other anti-Com elements” were engaged in a “systematic drive to destroy [the] PKI…with wholesale killings reported”; the “specific message” from the army “is that it is seeking to ‘finish off’ the PKI.”59 On November 13 police information chief Colonel Budi Juwono reported that “from 50–100 PKI members are being killed every night in east and central Java by civilian anti-Communist groups with blessing of [the] Army.” Three days later “bloodthirsty” Pemuda Pantjasila members informed the consulate in Medan that the organization “intends to kill every PKI member they can get their hands on.” Other sources told the consulate that “much indiscriminate killing is taking place.” Consular officials concluded that, even accounting for exaggerations, a “real reign of terror” was taking place.60 The CIA reported late in the month that former PKI members in Central Java were being “shot on sight by [the] Army.” Missionaries in East Java told the consulate in Surabaya that 15,000 Communists had reportedly been killed in the East Javanese city of Tulungagung alone. Again, even discounting for exaggerations, the consulate reported that a “widespread slaughter” was taking place.61 An Indonesian intelligence officer in East Java described several mass killings of PKI activists and supporters in Kediri (where 300 peasant farmers were killed, apparently by mistake), Wates (1,200 killed), and Ponggok (about 300 killed), with “many of those being killed…followers who do not know much.”62 It was still November. The embassy also turned over lists identifying thousands of PKI leaders and cadres to Indonesian army intermediaries.71 For several years U.S. officials had considered the Indonesian army’s intelligence gathering on the PKI to be woefully inadequate, especially at the local level. Marshall Green cabled the State Department in 1966 that Indonesian authorities still “seem to lack even the simplest information on PKI leadership.”72 Political officer Robert Martens and CIA analysts in the embassy compiled the lists, using published sources, to create detailed profiles of the PKI and its affiliate organizations from the national leadership down to regional, provincial, and local cadres. Martens handed the lists to Tirta Kentjana Adhyatman, an aide to Adam Malik who in turn passed them on to Suharto, who used them to track down PKI members for arrest and execution.73 Embassy officials subsequently denied that they had drawn up assassination lists, as did the major media in numerous exculpatory articles. The most intense killings generally took place where the PKI and its affiliates were strongest and where PKI activities, particularly in the area of land reform and labor activism, posed the greatest threat to existing social relations. As one scholar of the post-coup massacres put it, “The PKI was attacked because it proposed a full-scale restructuring of Indonesian society and in doing so had already created its own victims amongst those it saw as the beneficiaries and upholders of the established social order.”76 The army’s opposition to the PKI was, the CIA noted, “far more complicated than simple anti-Communism.” This was a war of position—army leaders viewed their campaign to eliminate the PKI leadership and destroy its infrastructure in strategic terms, as “a power struggle, not an ideological struggle,” with a rival power center in Indonesia that posed the chief obstacle to their vision of military-led modernization. The British consul at Medan framed the army-PKI struggle in Sumatra over control of local ports and rubber and tin estates as one “for the commanding heights of the Indonesian economy” and for the foreign exchange reserves and access to resources that such control conveyed. Not surprisingly, the tin and rubber estates in Northern Sumatra were the scene of some of the bloodiest attacks against PKI supporters, with the army “arresting, converting or otherwise disposing of some 3,000 PKI members a week.”77 The army, however, had to balance its desire to eliminate the PKI as a political force with its eventual need to restore political stability. By mid-December army leaders were expressing concern that the indiscriminate nature of the slaughter might exacerbate the breakdown in state power and unleash “monster[s] largely of its own creation,” such as political Islam and the student movement that could emerge as rival power centers and complicate the consolidation of their rule.78Unevenly, the army began taking steps to bring the killings more directly under their control, although the murder of PKI supporters and prisoners continued on a smaller scale well into 1966. 1. ↩ Representative works include Coen Holtzappel, “The 30 September Movement: A Political Movement of the Armed Forces or an Intelligence Operation?”Journal of Contemporary Asia 9, no. 2 (1979): 216–40; Central Intelligence Agency,Indonesia—1965: The Coup That Backfired(Washington, DC: CIA, 1968); John Hughes,Indonesian Upheaval (New York: David McKay, 1967); Justus M. van der Kroef, “Interpretations of the 1965 Indonesian Coup: A Review of the Literature,”Pacific Affairs43 (1970–1971): 557–77; Daniel S. Lev, “Indonesia 1965: The Year of the Coup,”Asian Survey6 (1966): 103–11; Peter Dale Scott, “The United States and the Overthrow of Sukarno, 1965–1967,”Pacific Affairs58 (1985): 239–64; Brian May,Indonesian Tragedy(London: Graham Brash, 1978); R. E. Elson,Suharto: A Political Biography (Cambridge: University of Cambridge Press, 2001); and W. F. Wertheim, “Whose Plot? New Light on the 1965 Events,”Journal of Contemporary Asia 9, no. 2 (1979): 197–215. 2. ↩ Odd Arne Westad,The Global Cold War: Third World Interventions and the Making of Our Time (Cambridge: Cambridge University Press, 2005), 185; Telegram 868 from Jakarta to State, October 5, 1965,Foreign Relations of the United States [FRUS], 1964–1968, v. 26 (Washington, DC: Government Printing Office, 2001), 307. 3. ↩ “The Legacy of Violence in Indonesia,” special edition ofAsian Survey 42 (July–August 2002). 4. ↩ C. L. Sulzberger, “When a Nation Runs Amok,”New York Times, April 13, 1966; “Indonesia: Night of Terror, Dawn of Hope,”Reader’s Digest, October 1966. 5. ↩ Saskia Wieringa, “Birth of the New Order State in Indonesia: Sexual Politics and Nationalism,”Journal of Women’s History15, no. 1 (2003): 70–91. Accounts repeating the army’s propaganda claims include Arnold Brackman,Communist Collapse in Indonesia (New York: Norton, 1969), 79; Hughes,Indonesian Upheaval, 43–57; and Paul F. Gardner,Shared Hopes, Separate Fears: Lyndon Johnson and the Wars for Vietnam (Chicago: I. R. Dee, 1995), 221. 6. ↩ Benedict Anderson, “How Did the Generals Die?”Indonesia 43 (1987): 109–34. 7. ↩ Harold Crouch,The Army and Politics in Indonesia (Ithaca, NY: Cornell University Press, 1978), 138–39. 8. ↩ CIA Intel Memo OCI 2940/65, November 8, 1965, National Security Files [NSF], CO Files, Indonesia, Memos, v. 6, Lyndon Baines Johnson Library [LBJL]. 9. ↩ Telegram 2134 from Jakarta to Foreign Office, October 13, 1965, FO 371-180318, United Kingdom National Archives [UKNA]. 10. ↩ Frederick Bunnell, “American ‘Low-Posture’ Policy Toward Indonesia in the Months Leading Up to the 1965 ‘Coup,'”Indonesia50 (1990): 59. Military attaché Willis Ethel and Deputy CIA Station Chief Joe Lazarsky met on a near-daily basis with aides of General Nasution and, apparently, Suharto as well. 11. ↩ Telegram 812 from Jakarta to State, October 2, 1965; Telegram 858 from Jakarta to State, October 5, 1965; and CIA Intel Memo OCI 2330/65, “The Upheaval in Indonesia,” October 3, 1965, all in NSF, CO Files, Indonesia, v. 5, Memos, October-November 1965, LBJL. 12. ↩ Telephone conversation between Ball and James Reston, October 4, 1965, Ball Papers, Box 4, Indonesia, April 1964–November 1965, LBJL. 13. ↩ Telegram 400 from State to Jakarta, October 6, 1965, RG 59, Central Files, 1964–1966, POL 23-9, Indonesia, National Archives and Records Administration [NA]. 14. ↩ Telegram 868 from Jakarta to State, October 5, 1965; and Telegram 851 from Jakarta to State, October 5, 1965, both in RG 59, Central Files, 1964–1966, POL 23-9, Indonesia, NA; Ralph McGehee, “The CIA and the White Paper on El Salvador,”Nation, April 11, 1981. 15. ↩ Top Secret Telegram from the Political Adviser to CinCFE Singapore, October 1, 1965, FO 1011-2, UKNA. 16. ↩ Memo for the Minister for External Affairs, “The Indonesian Situation,” October 12, 1965, Series A1838/280, Item 3034/2/l/8/Pt. 2, Indonesia—Political—Coup d’État of October 1965, National Archives of Australia. 17. ↩ Telegram 1835 from Foreign Office to POLAD Singapore, October 6, 1965, FO IOII-2, UKNA. 18. ↩ David Easter, “British Intelligence and Propaganda During the Confrontation 1963–6,”Intelligence and National Security16, no. 2 (2001): 90–99. Ian Stewart of theNew York Times, writing from Singapore, cited “Western sources” who claimed that Sukarno “not only knew about the coup but was one of its prime movers” (Stewart, “Sukarno Seen Behind Coup,”New York Times, October 5, 1965). Seth King cited “informed sources in Bangkok,” speaking on “information reaching them through private channels” in Jakarta (King, “Indonesian Army Battles Rebels in Key Java City,”New York Times, October 7, 1965). 19. ↩ Telegram 1835 from Foreign Office to PO LAD Singapore, October 6, 1965, FO 1011-2, UKNA; Telegram 400 from State to Jakarta, October 6, 1965, NSF, CO Files, Indonesia, v. 5, LBJL; CIA Memo on Covert Assistance to Indonesian Armed Forces Leaders, November 9, 1965,FRUS, 1964–1968, v. 26, 361. 20. ↩ Letter from British Embassy in Washington to Southeast Asia Department of the Foreign Office, October 5, 1965, Indonesia subseries of FO 371 (DH) 1015.163, UKNA; Action Telegram 405 from State to Jakarta, October 6, 1965, RG 59, Central Files, 1965–1966, POL 23-8, Indonesia, NA; Letter from British Embassy in Washington to Southeast Asia Department of the Foreign Office, October 5, 1965, DH 1015.163, UKNA. 21. ↩ Memo, “Getting at Nasution,” December 24, 1965, FO 1011-8, UKNA. 22. ↩ Ralph McGehee, “Indonesian Massacres and the CIA,”Covert Action35 (1990): 58; Foreign Broadcast Information Service (FBIS), “Counterrevolutionary Documents Uncovered,” October 25, 1965, 12–13; Telegram 1086 from Jakarta to State, October 19, 1965, NSF, CO Files, Indonesia, v. 5, LBJL; Telegram 740 from Hong Kong to State, October 27, 1965, RG 59, Central Files, 1964–1966, XR POL 23-9, Indonesia, NA; Gardner,Shared Hopes, Separate Fears, 2l9. 23. ↩ Telegram 903 from Jakarta to State, October 7, 1965, RG 59, Central Files, 1964–1966, XR POL 23-9, Indonesia, NA. 24. ↩ Letter from British Embassy Jakarta to Foreign Office, November 25, 1965, FO 371-181323, UKNA; CIA, OCI 13185, October 8, 1965, NSF, CO Files, Indonesia, v. 5, LBJL. 25. ↩ Telegram 910 from Jakarta to State, October 8, 1965, RG 59, Central Files, 1964–1966, POL 23-9, Indonesia, NA. 26. ↩ Michael van Langenberg, “Gestapu and State Power,” and Robert Cribb, “Introduction,” both in Robert Cribb, ed.,Indonesian Killings of 1965–1966: Studies from Java and Bali(Victoria, Australia: Monash University Center of Southeast Asian Studies, 1990), 29, 35, 47–49. 27. ↩ Telegram 1863 from Foreign Office to POLAD Singapore, October 9, 1965, FO 1011-2, UKNA. 28. ↩ Airgram A-82 from Jakarta to State, August 17, 1966, RG 59, Central Files, 1964–1966, POL 23-9, Indonesia, NA. 29. ↩ Crouch,Army and Politics in Indonesia, 142–48. 30. ↩ Telegram 452 from State to Jakarta, October 13, 1965, NSF, CO Files, Indonesia, v. 5, LBJL. 31. ↩ Telegram 400 from State to Jakarta, October 6, 1965, NSF, CO Files, Indonesia, v. 5, LBJL. 32. ↩ Telegram 971 from Jakarta to State, October 12, 1965, RG 59, Central Files, 1964–1966, POL 23-9, Indonesia, NA. 33. ↩ Telegram from Jakarta to State, October 14, 1965, RG 59, Central Files, 1964–1966, DEF 21, Indonesia, NA; Memo from David Cuthell to William Bundy, November 3, 1965,FRUS, 1964–1968, v. 26, 348–51. 34. ↩ Telegram 470 from State to Jakarta, October 14, 1965, NSF, CO Files, Indonesia, v. 5, LBJL; Telegram 508 from State to Jakarta, October 22, 1965,FRUS, 1964–1968, v. 26, 330–31. 35. ↩ CIA Information Cable, OCI 13114, October 17, 1965, NSF, CO Files, Indonesia, v. 5, LBJL; Telegram 1047 from Jakarta to State, October 17, 1965, RG 59, Central Files, 1964–1966, POL 23-9, Indonesia, NA. 36. ↩ Telegram 1090 from Jakarta to State, October 20, 1965, RG 59, Central Files, 1964–1966, POL 12, Indonesia, NA. 37. ↩ Telegram 1195 from Jakarta to State, October 25, 1965, RG 59, Central Files, 1964–1966, POL 23-9, Indonesia, NA. 38. ↩ Telegram 1171 from Jakarta to State, October 23, 1965; and Telegram 1166 from Jakarta to State, October 23, 1965, both in NSF, CO Files, Indonesia, v. 5, LBJL; Australian Embassy, Jakarta Memo of Conversation with Mr. J. S. Hadie, October 13, 1965, Series A1838/280, Item 3034/2/I/8/Pt. 2, Indonesia—Political—Coup d’État of October 1965, National Archives of Australia; Telegram 1182 from Jakarta to State, October 25, 1965, RG 59, Central Files, 1964–1966, POL 23-9, Indonesia, NA. 39. ↩ Telegram 1228 from Jakarta to State, October 28, 1965, NSF, CO Files, Indonesia, v. 5, LBJL. 40. ↩ Telegram 545 from State to Jakarta, October 29, 1965,FRUS, 1964–1968, v. 26, 340–43. 41. ↩ Telegram 545 from State to Jakarta, October 29, 1965,FRUS, 1964–1968, v. 26, 340–43. 42. ↩ See Editorial Note,FRUS, 1964–1968, v. 26, 338–40. 43. ↩ Telegram 1215 from Jakarta to State, October 26, 1965, NSF, CO Files, Indonesia, v. 5, LBJL. 44. ↩ Telegram 1255 from Jakarta to State, October 28, 1965, RG 59, Central Files, 1964–1966, POL 23-9, Indonesia, NA. 45. ↩ Memo from Assistant for Indonesia to Deputy Assistant Secretary of Defense for ISA, October 30, 1965,FRUS, 1964–1968, v. 26, 343–45; Telegram 1288 from Jakarta to State, November l, 1965, RG 59, Central Files, 1964–1966, POL 23-9, Indonesia, NA. 46. ↩ Telegram 1304 from Jakarta to State, November 2, 1965, NSF, CO Files, Indonesia, v. 5, LBJL; Memo from Assistant for Indonesia to Deputy Assistant Secretary of Defense for ISA, October 30, 1965,FRUS, 1964–1968, v. 26, 351–53. 47. ↩ Telegram 1326 from Jakarta to State, November 4, 1965, RG 59, Central Files, 1964–1966, POL 23-9, Indonesia, NA. 48. ↩ Dean Rusk, for example, emphasized to Galbraith the need for a political channel with the army “as distinct from Indonesian Government”; Telegram 562 from State to Jakarta, November 1, 1965, RG 59, Central Files, 1964–1966, POL 23-9, Indonesia, NA. 49. ↩ Bunnell, “American ‘Low Posture’ Policy Toward Indonesia,” 59; Telegram 2536 from Jakarta to Foreign Office, November 14, 1965, FO 371-181519, UKNA. 50. ↩ Telegram 920 from Jakarta to State, November 5, 1965, NSF, CO Files, Indonesia, v. 5, LBJL; Memo for the 303 Committee, November 17, 1965,FRUS, 1964–1968, v. 26, 367–37I; Letter from M. H. Clapham to the Secretary, Department of External Affairs, “Arms Given to KAMI,” June 24, 1966, Cablegram, Series AIS3Sh, Item 3034/2/I/8 Pt. 15, Indonesia–Political Coup 30-9-65 Folder, National Archives of Australia. 51. ↩ Telegram 95I from Bangkok to State, November II, 1965, RG 59, Central Files, 1964–1966, POL 23-9, Indonesia, NA. 52. ↩ Telegram 1427 from Jakarta to State, November 12, 1965, RG 59, Central Files, 1964–1966, POL, Indonesia-US, NA. 53. ↩ Memo for the 303 Committee, November 17, 1965,FRUS, 1964–1968, v. 26, 367–71. 54. ↩ Top Secret Memo from the British Embassy in Washington to the Foreign Office, January 4, 1966, FO 371-187583, UKNA; Telegram 2536 from Jakarta to Foreign Office, November 14, 1965, FO 371-181519, UKNA. 55. ↩ Kathy Kadane, letter to Editor,New York Review of Books, April 10, 1997; “Ex-Agents Say CIA Compiled Death Lists for Indonesians,”States News Service, May 19, 1990. The scant CIA documents that have thus far been released are consistent with Kadane’s claims that the CIA set Indonesian army radio frequencies in advance for the purposes of gathering intelligence. 56. ↩ CIA, OCI 12857, October 5, 1965; and Indonesian Working Group, Situation Report 10, October 6, 1965, both in NSF, CO Files, Indonesia, v. 5, LBJL. 57. ↩ Telegram 545 from State to Jakarta, October 29, 1965,FRUS, 1964–1968, v. 26, 340–43; Telegram 1255 from Jakarta to State, October 28, 1965, RG 59, Central Files, 1964–1966, POL 23-9, Indonesia, NA. 58. ↩ Telegram 1326 from Jakarta to State, November 4, 1965, RG 59, Central Files, 1964–1966, POL 23-9, Indonesia, NA. 59. ↩ Telegram 1374 from Jakarta to State, November S, 1965, NSF, CO Files, Indonesia, v. 5, LBJL; Telegram 1401 from Jakarta to State, November 10, 1965, RG 59, Central Files, 1964–1966, POL 23-9, Indonesia, NA. 60. ↩ Telegram 1438 from Jakarta to State, November 13, 1965; and Telegram 65 from Consulate in Medan to State, November 16, 1965, both in RG 59, Central Files, 1964–1966, POL 23-9, Indonesia, NA. 61. ↩ CIA Intel Memo, OCI 2943/65, “Indonesian Army Attitudes Toward Communism,” November 22, 1965, NSF, CO Files, Indonesia, v. 6, LBJL; Telegram 41 from Surabaya to State, November 27, 1965, RG 59, Central Files, 1964–1966, POL 23-8, Indonesia, NA; Telegram 32 from Surabaya to State, November 14, 1965, NSF, CO Files, Indonesia, v. 5, LBJL. 62. ↩ “Report from East Java,”Indonesia41 (April 1966), 145–46; see also Hermanawan Sulistyo, “The Forgotten Years: The Missing History of Indonesia’s Mass Slaughter (Jombang-Kediri 1965–1966),” (PhD diss., Arizona State University, 1997), 188–214. 63. ↩ Quoted in H. W. Brands, “The Limits of Manipulation: How the United States Didn’t Topple Sukarno,”Journal of American History 76 (1989): 803; see also B. Hugh Tovar and J. Foster Collins, “Sukarno’s Apologists Write Again,”International Journal of Intelligence and Counterintelligence9 (1996): 355; Gardner,Shared Hopes, Separate Fears, 230–33. 64. ↩ “Protest Awaited on Murder of Communists,” letter to Editor,New York Times, January 17, 1966; “Our ‘Anti-Communism,'” letter to Editor,New York Times, March 27, 1966; “Indonesia’s Purge,” letter to Editor,New York Times, May 22, 1966; “Indonesia’s Genocide,” letter to Editor,New York Times, June 19, 1966. 65. ↩ Memo with attachment from Rostow to Johnson, June 8, 1966, NSF, CO Files, Indonesia, v. 7, May 1966–June 1967, LBJL. 66. ↩ Telegram 1401 from Jakarta to State, November 10, 1965, RG 59, Central Files, 1964–1966, POL 23-9, Indonesia, NA; Confidential Memo from H. S. H. Stanley, October 13, 1965, FO 371-181455-1, UKNA.epared in the CIA, November 9, 1965,FRUS, 1964–1968, v. 26, 361–63; Federspiel, quoted in Kadane, “Ex-Agents Say CIA Compiled Death Lists for Indonesians,”States News Service, May 19, 1990. In a letter to biographer Kai Bird, William Bundy wrote, “I don’t suppose that certain people would forgive what we did, but I thought that it was eminently justified” (Kai Bird,Color of Truth: McGeorge Bundy and William Bundy—Brothers in Arms [New York: Simon and Schuster, 1998], 353). 67. ↩ Memo prepared in the CIA, November 9, 1965,FRUS, 1964–1968, v. 26, 361–63; Federspiel, quoted in Kadane, “Ex-Agents Say CIA Compiled Death Lists for Indonesians,”States News Service, May 19, 1990. In a letter to biographer Kai Bird, William Bundy wrote, “I don’t suppose that certain people would forgive what we did, but I thought that it was eminently justified” (Kai Bird,Color of Truth: McGeorge Bundy and William Bundy—Brothers in Arms [New York: Simon and Schuster, 1998], 353). 68. ↩ In interviews with Bunnell in 1981–1982, Sukendro confirmed that the CIA station in Bangkok did deliver the small arms; Bunnell, “American ‘Low Posture’ Policy Toward Indonesia,” 59. 69. ↩ Telegram 1628 from Jakarta to State, December 2, 1965,FRUS, 1964–1968, v. 26, 379–80. 70. ↩ Telegram 1651 from Jakarta to State, December 4, 1965, RG 59, Central Files, 1964–1966, POL 23-9, Indonesia, NA. 71. ↩ CIA officials helped their Guatemalan intelligence counterparts compile similar lists (of more than 70,000 people), and for similar purposes, after the U.S.-sponsored overthrow of the Arbenz regime in 1954. See Stephen Streeter,Managing the Counterrevolution: The United States and Guatemala, 1954–1961 (Athens, OH: Ohio University Press, 2000), 38–41. 72. ↩ Airgram A-74 from Jakarta to State, August 10, 1966, RG 59, Central Files, 1964–1966, POL 12, Indonesia, NA. 73. ↩ Kadane, “Ex-Agents Say CIA Compiled Death Lists for Indonesians”; Michael Wines, “CIA Ties Asserted in Indonesia Purge,”New York Times, July 12, 1990; Stephen Rosenfeld, editorial,Washington Post, July 12, 1990; Robert Barnett note to Green, Green Papers, Box 15, HI; Robert Martens, unpublished manuscript, Green Papers, Box 15, HI. 75. ↩ Letter from British Embassy Jakarta to Foreign Office, December 16, 1965, FO 371-181323, UKNA. 76. ↩ Cribb,Indonesian Killings of 1965–1966, 6; Cribb, “Unresolved Problems in the Indonesian Killings of 1965–1966,”Asian Survey42 (2002): 550–64. 77. ↩ See Airgram A-512 from Jakarta to State, February 11, 1966, RG 59, Central Files, 1964–1966, DEF 6, Indonesia, NA; Dispatch from Medan to Foreign Office, January 3, 1966, FO 371-186027, UKNA; Letter from British Consulate Medan to Jakarta, January 3, 1966, FO 371-186026, UKNA. 78. ↩ Letter from British Consulate Medan to Jakarta, December 14, 1965, FO 371-180333, UKNA; Guidance no. 26 from Foreign Office and Commonwealth Relations Office to Certain Missions, January 18, 1966, FO 371-186027, UKNA. 79. ↩ Draft, “Indonesia Internal Situation,” undated, Series A1838/2, Item 3034/2/I/8/Pt. 15, Indonesia—Political Coup 30-9-65 Folder, National Archives of Australia. 80. ↩ See Cribb,Indonesian Killings of 1965–1966, 12 and 1–45, for a nuanced and detailed discussion of the historiography of the massacres. 81. ↩ Memo from Foreign Office and Commonwealth Relations Office to Certain Missions, January 18, 1966, DH 1015/280, FO 371-180024, UKNA; Letter from James Murray, Embassy Jakarta, to Foreign Office, January 13, 1966, FO 871180325, UKNA; Memo 1011/66 from James Murray to A. J. de la Mare, January 13, 1966, FO 371-186027, UKNA. 82. ↩ Telegram 2347 from Jakarta to State, February 21, 1966, RG 59, Central Files, 1964–1966, POL 23-9, Indonesia, NA; Letter from British Embassy in Jakarta to Foreign Office, February 23, 1966, DH 1015/80, FO 371-186028, UKNA. 83. ↩ Memo from Rostow to Johnson, June 8, 1966, NSF, CO Files, Indonesia, v. 7, May 1966–June 1967, LBJL. 84. ↩ Airgram A-64I from Jakarta to State, April 15, 1966, RG 59, Central Files, 1964–1966, POL 2, Indonesia, NA. 85. ↩ CIA Intel Memo, OCI 2943/65, “Indonesian Army Attitudes Toward Communism,” November 22, 1965, NSF, CO Files, Indonesia, v. 6, LBJL; Crouch,Army and Politics in Indonesia, 151–55. 86. ↩ Airgram A-263, December 24, 1966, NSF, CO Files, Indonesia, Box 248, Indonesia Cables, v. 6, November 1965–May 1966, LBJL; C. L. Sulzberger, “When a Nation Runs Amok,”New York Times, April 13, 1966, 40. 87. ↩ Memo of Conversation, February 14, 1966, RG 59, Central Files, 1964–1966, POL 2, Indonesia, NA. Cribb (“Unresolved Problems in the Indonesian Killings”) argues that there is no evidence that Washington’s assistance led to greater levels of killing. 88. ↩ Gardner,Shared Hopes, Separate Fears, 227; Marshall Green,Indonesia: Crisis and Transformation, 1965–1968(Washington, DC: Compass, 1990), 69; Tovar and Collins, “Sukarno’s Apologists,” 356; Tovar, “Indonesian Crisis of 1965–1966: A Retrospective,”International Journal of Intelligence and Counterintelligence7, no. 3 (1994). 89. ↩ Robert J. McMahon,The Limits of Empire: The United States and Southeast Asia Since World War II(New York: Columbia University Press, 1999), 113–24; H. W. Brands,The Wages of Globalism: Lyndon Johnson and the Limits of American Power(New York: Columbia University Press, 1995), 176; John Subritzky,Confronting Sukarno (New York: St. Martin’s, 2000), 176; exceptions include Bunnell, “American ‘Low Posture’ Policy Toward Indonesia,” 58–60; and Bird,Color of Truth, 352–54.